This is one of my favorite things to talk about on here...MAIL! I love ordering things and getting them in the mail, but I also love getting boxes full of unknown goodies from friends and subscription boxes like BirchBox. This is like my 5th or 6th time doing the Cara Box exchange and each time Kaitlyn over at Wifessionals changes something I'm just going with the flow! This time you needed to be a member of Instagram and post at least once every three days. The point was to be more interactive with your partners and while I got glimpses of my partners lives, I was thankful my partners were also involved in the great emails we exchanged back and forth. I learn so much with my bullet style questions, lol. I was also thankful I got paired up with girls with blogs! Yay!!! Not that I commented much or kept up but I had that to look at in the beginning to see their life outside of the pictured on Instagram. The pretty box I received came from Lyndsey who lives just South of me. Unfortunately our lives weren't able to mesh and meet, but that's not to say we won't ever meet up being so close! She got me some awesome pampering stuff to help me shine bright like a star! Her card was so inspirational and pretty. Butterflying perfect! Lip gloss, score! I can't wait to relax with the bath soak this weekend!! I even tested out the pink nail polish with the sparkles on top! One of the things not pictured is a gold glittery mason jar Lyndsey made that didn't survive the short trip :( It made me want to actually stop pinning the how to mason jar stuff and do it myself! 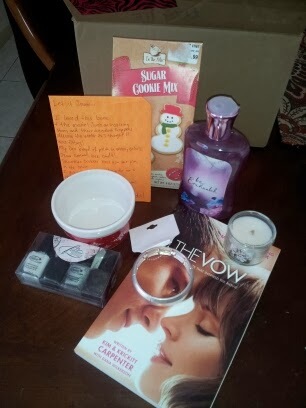 I sent a box to Karen and I didn't take a pic before I sent it, but luckily she sent me a pic of the stuff she got! You can check out her reveal post here! Special thanks to Kaitlyn for being so fabulous and putting this swap together! The next exchange I'm signed up for is the Mug Swap! Do you like to participate in swaps? I love giving gifts, so when I find one I like I'm all for it! 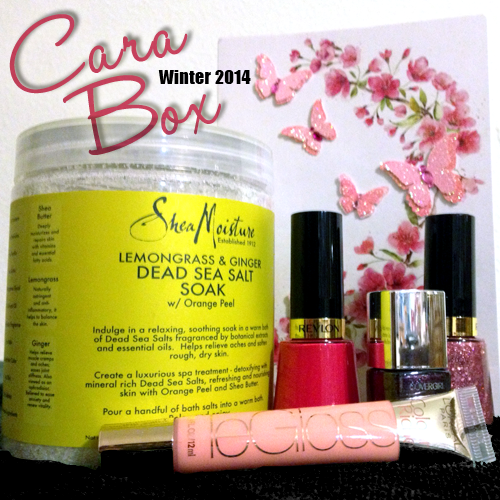 I miss those Cara Box days! The Sea salt sounds fabulous! That stinks the mason jar didn't make it but everything else looks good. I am so excited for the mug swap! How fun! Boo to the jar breaking. :( But what a great box! That polish looks great with your skin tone and that lip gloss - my fave!